What does it mean if Trump was personally investigated by the FBI? Writing was never put on the post, because Trump advisors thought it gave the impression that Comey was fired because of that investigation. The Deputy Minister of Justice, Rod Rosenstein, wrote a new version stating that Comey had been dismissed because he had ruined an investigation into the use of a personal e-mail address for work by Hillary Clinton. The reasoning behind it was, according to the sources, that if Trump did indeed try to obstruct the legal process to conceal the fact that he was looking after Russian interests, it would combine the criminal and counter-espionage aspects of the case. On top of that, the counter-espionage aspect also provides access to intelligence gathered by intelligence services of foreign allies. This is particularly interesting because in the international intelligence world: Russia spies on everyone and everyone spies on Russia. Another striking detail: that the FBI almost immediately had access to the letter from Trump to Comey (a never-sent draft version of the office of the president), suggests that someone from his immediate circle has been cooperating with the Russia investigation for some time. 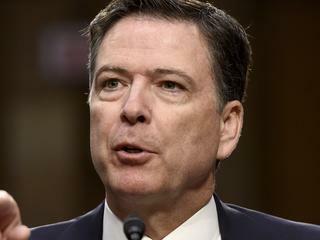 "Wow, just read in the Falling New York Times that the corrupt former FBI leaders, almost all of whom have been laid off or forced to leave have been forced because of some very bad things, an investigation into me, without reason and without proof, after I have fired that total snub, Lying James Comey! " he wrote, among other things.